I am writing this post on Friday and scheduling it to be posted on Sunday, as I will be away for a weekend, and I don't want to miss doing this week's recap. If anything interesting happens between the time I write this and the time it gets posted - well, actually, I doubt it will, as nothing usually happens on weekend. So here we go again. The collection is gorgeous, as usual for Tribute stores. There are some pretty, high fashion items, and interesting accessories. Prices are pretty high, higher than the usual, even for tribute stores. And there is even a dress for superstars only. A nice trick from Stardoll - if someone wants to buy a whole collection, they would need to be superstars, otherwise they'd miss one item, making the collection incomplete. Though with prices like these, I don't think many will actually buy the whole collection. I mean, it is nice, but not all of the items are that nice, and buying them just so you can have a full collection- not sure is it worth it. Still, some users like having real life inspired designs outfits which would cost way more in boutiques. Anyway, my favorite items are bags, and maybe a few dresses. I won't be buying much I think. Still waiting. So there is a variety of activities, as you can see on Stardoll page for Ramadan. One is like shown above, we need to search for keys on certain days in order to get gifts. They are week apart, and for the last gift, you need to be a superstar/royalty member. I am not sure it will be worth it buying a superstar membership for a single gift, but who knows? 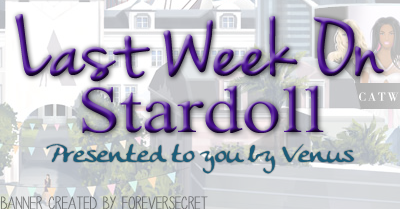 The other activities are that you can dress your doll and suite in honor and themed by this holiday, and get featured on Stardoll Ramadan page, as well as make a party and get stardollars and get featured as well. I preferred the Ramadan Calender, but this is okay as well. The usual clothes for this store - dark, goth type of clothes. Okay, there are some non black clothes. One dress is for superstars only. Is this a new trend by Stardoll? I am not really influenced on buying anything from this collection, or the store overall, as I have left this style a while ago, and this store will stay longer and maybe even have a sale, so it'd be worth waiting. Few starcoin items, as usual, and ordinary prices, as usual as well. 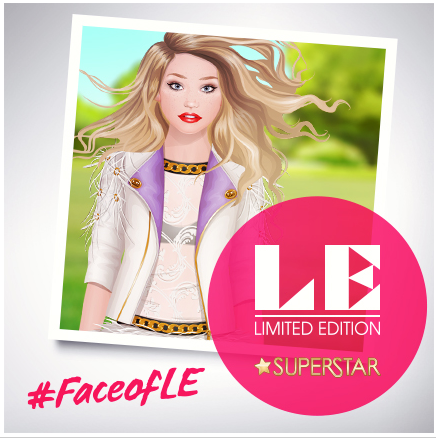 So on Friday, Stardoll released a new contest - quite interesting one this time - Who will be the face of LE! So Stardoll is looking for a member to be a face of the newest LE collection, which is coming out somewhere after 20th of July, when the contest ends. You need to "Use your imagination and show us your interpretation of what the new collection would look like if YOUR STARDOLL was the model.". After you take a photo of your doll, you need to submit it to your Instagram or Twitter profile and tag @Stardoll and use hash tag #FaceOfLE. So this time, we have an approximate date of the newest collection of LE release, as well as a brief description of how the store will look like. Judging by that description, I do not feel inspired in buying superstar membership in order to buy a new LE, but still, who knows? I was, in fact, planning on renewing my membership anyway, so.. we'll see. 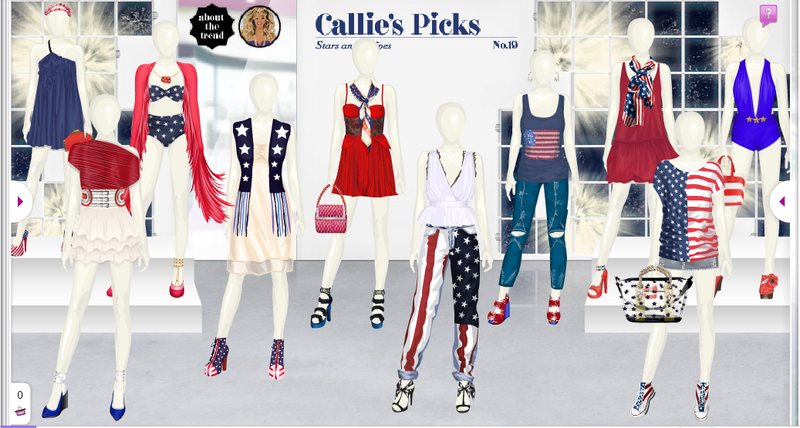 And the final (hopefully) event of a week, a little bit late new Callie's Picks store release - this time inspired by US holiday Independence Day. Maybe it was the whole idea, the store being released on the exact day of Holiday. Colors red, blue and white dominate in this collection. There are some really nice items, some rares as usual. You can use those pieces to honor the holiday, or either wear them just like regular clothes and make 'ordinary' outfits, it's your choice. Not a lot of rare stuff got released, so I guess not many collectors are angry and or disappointed. Quite an interesting week, agree? Vote on the poll, maybe leave a comment, and see you next week.